A while back we came up with a system to rate the trails we rode. The toughest so far was Pargadh which we rated at 8 out of 10 in the rains and 7 out of 10 when dry. We decided that a trail which we couldn’t be able to complete would get the honor of being rated 10 out of 10. Yesterday we found such a trail off the Chorla Ghat. 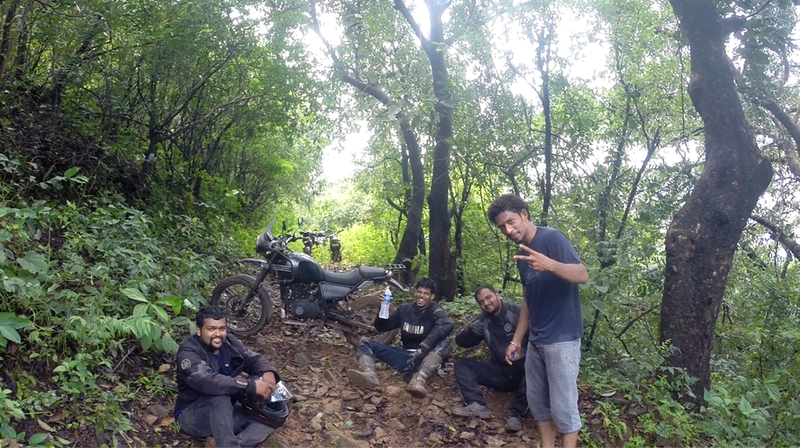 We were taken to this trail by Mashruf Shah​, a person who has got quite a bit of attention from some of my friends watching my videos, less for his riding skills and more for not wearing a crash helmet and riding gear. Hopefully that will change in subsequent rides. We turned back after attempting to ride our motorcycles up the first slope of the trail. The slope wasn’t very steep and I’m pretty sure when its dry, it will be a breeze to climb up. But the large flat and loose stones on the trail made it practically impossible to ride up the trail when its wet with slush acting like a lubricant. The rear tyre spins like crazy and you don’t move an inch forward. It’s like doing a burnout, just that you don’t need to press the front brake. However, that didn’t stop Masruf from bouncing his stock Hero Honda Splendor off the slippery rocks and climb up. But after pushing our relatively heavy motorcycles up for a distance we concluded that it wasn’t worth the trouble, decided to rate the trail a 10 our of 10 in the rain and turn back.